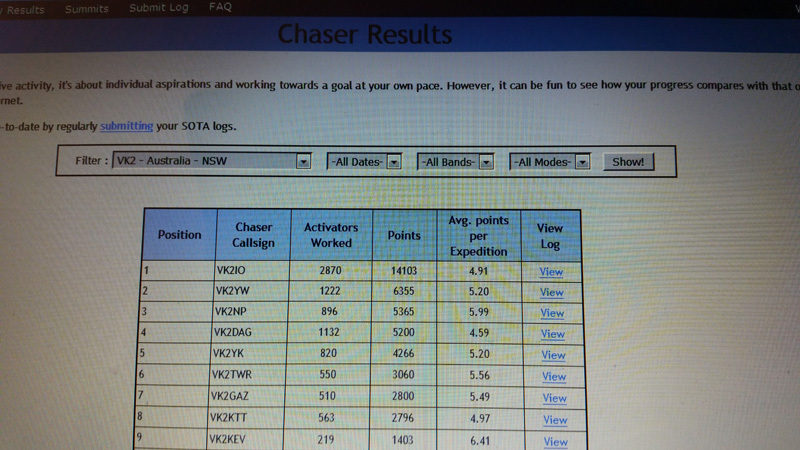 For months now I have been chasing Paul VK2KTT on the SOTA NSW Role of Honour, he has been #7 for some time while I have languished at #8. Each time I manage to get a little closer to Paul’s total, which at present is 2,796 he bounds away again. I might add, as far as I am aware Paul VK2KTT is totally unaware of my efforts!! However, with all the SOTA action on the October long weekend 03-05 Oct 2015, I finally managed to push my nose in front with a score of 2,800 and claimed the covenanted #7 position. Look out Rod VK2TWR #6!! Now the last time I wangled my way in front of Paul, within days if not hours, he jumped away again. I wonder how long before he does so again. The question still remains, who will ever overtake Gerard VK2IO in position #1 on the almost unbeatable score of 14,103 and climbing. Hi Garry, good fun. You are close to catching Rod VK2TWR. Thanks for chasing today, good to have you in the log from Mt Palerang and South Black Range. Its all about being in the right place at the right time. Well done mate.